Forget classic ice cream flavors like vanilla and chocolate, because the latest idea in weird ice creams after flavors like octopus, squid, ox tongue and probably the vilest of all, raw horseflesh, is a glow-in-the-dark ice cream. This particular ice cream was created in the U.K. by the 2011 Winner of Barclays Take One Small Step Competition, food inventor Charlie Harry Francis, who is the founder of Lick Me I’m Delicious - which sounds sort of like the title of a dirty movie - instead it's a catchy name for a boutique ice cream company. Lick Me I'm Delicious is based in Bristol and is already known for its unusual ice cream concoctions using ingredients like beer, cheese, beef and gold leaf. Francis came up with the idea of creating this new ice cream after reading a research paper on jellyfish and he was able convince scientists in China to synthesize the luminescent protein that characterizes these types of invertebrates. 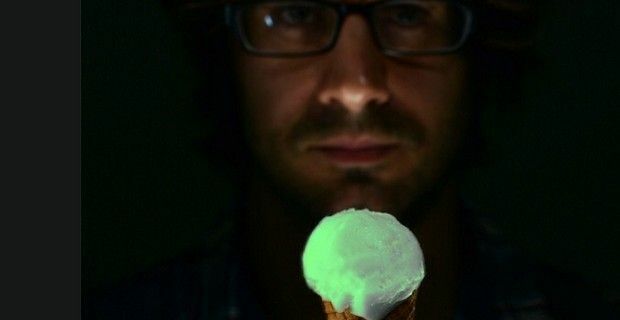 The ice cream just doesn’t sit there and glow with an eerie green sheen in your freezer, it becomes luminescent only when the jellyfish proteins interact with the tongue's heat and pH levels, so the more you lick it, the more brighter it becomes. The only drawback regarding the glow-in-the dark ice cream, is the cost. A small scoop scoop of the stuff will set you back a whopping £200, so evidently it is a ‘very rich' dessert. 'It is probably the most expensive ice cream I have made because the jellyfish luminescence is four times more expensive than gold. So each scoop costs me around £140. It tastes pretty good though,' commented Francis. I think we’ll stick with a very decadent double dark chocolate ice cream for the time being.